There are electrical outlets on either side of the bed. On the left, Terry’s side, the upper outlet is controlled by a wall switch. We have a lamp plugged in there. The bottom had the bed warmer plugged in, and Terry unplugged it in whenever she used the heating pad. So she didn’t have to do that I plugged in a three-plug extender. That worked fine for a long time. But after her knee replacement surgery she needed cold not heat. She did, however, use the lower plug for charging her iPhone. Problem was, the three-plug came out with the charger, aggravating Terry, who had enough to deal with. So I moved the bed warmer plug over to my side. To do this I tried to install a six-plug extender that we had on hand. Turned out it was dead, dead, dead. 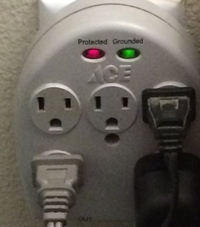 Instead I plugged in a five-outlet surge protector that I had in my trusty wire box. It has two LEDs. With all of our electronics, we have LEDs all over the house. So now we have two more. I guess that’s OK. What’s two more LEDs?